There’s been a new celebrity in Big Guy’s class since school resumed after Christmas break. Every morning before the bell, three or four kids cloister around him, in awe at his status as a cool kid and envious because their parents deprive them of similar stature. It’s the kid who got a Nintendo DS from Santa. Painfully shy, he squirms a bit because he’s not used to being the center of attention. But he draws a crowd. So does his 4-year-old DS-toting sister. I have let educational software morph into two computer games, a concession that lets me remain smugly sanctimonious about not allowing a console in the house. But a con$ole? Or a Nintendo D$? Getting the idea that part of my concern is financial. You bet it is. Wii console, $250, games $50 for the marquee titles. And, no, Wii should not be a fitness program for children. Nintendo DS, $100 or so, games $20 and up. In the case of Big Guy, a Wii would wind up being the bargain. This is the kid who would lose his fanny were it not attached and can’t find his shoes when he’s about to trip over them. The tiny, lightweight DS would have the life expectancy of a house fly with him. There’s also the addiction factor. The kind that led one mom to ground her son from his DS for a week after the 7-year-old hit her when she told him it was time to quit playing. 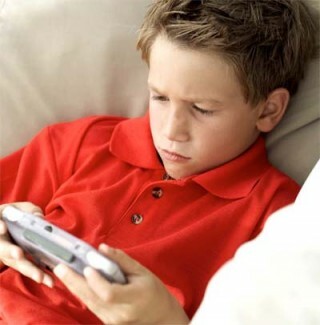 “Left unchecked my son can play on his DS six hours a day or more. He’ll play on the toilet, in the bed, bring it to the neighbors. It starts to follow him like a bad cold,” Rassil wrote at Silicon Valley Moms. Oh, that’s the last thing I need: Another thing to battle Big Guy about. He’s been surprisingly nonchalant about Guitar Hero and the other game he got at Christmas. He’ll play each maybe once a week now, for well under an hour. During the early dark days, I was ready to drag a nail file down both DVDs and plead “oops” rather than fight him again to get away from the computer. It’s a battle already trying to keep the DS drug dealers at bay. An older friend keeps offering to let Big Guy borrow hers on the weekend – never mind that I’ve asked repeatedly that she not – and even that much starts a hassle as Big Guy begs me to relent and let him have it on a week night. Maybe I should be glad she’s always magically no where to be found when the weekend rolls around. I’ve seen the dazed look in Big Guy’s eyes when he’s near a DS, and it’s the look of an addict. Maybe familiarity would breed contempt if he actually owned one. That’s all the more reason, though, to not blow $150 or so on something he’d either lose or Boots would dismantle within a week of its arrival.